Schnippel preaches at St. John Neumann and Corpus Christi churches, and last December he appeared on ABC’s Great American Baking Show. 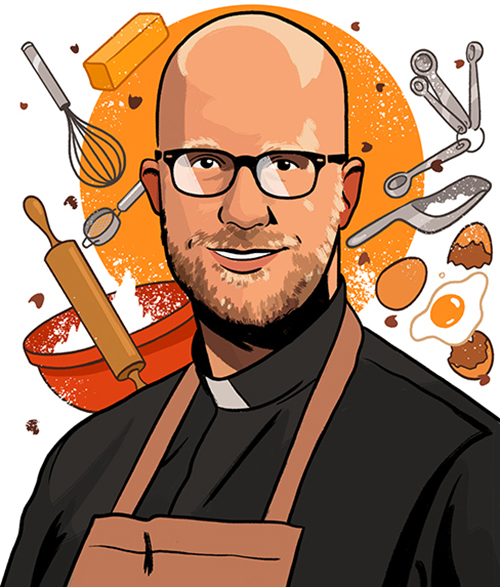 For him, baking and priesthood go hand in hand. Why baking? All the things we do as priests—counseling, preparing homilies—we always have something going in the back of the brain, so having a creative outlet that’s in a different direction can be refreshing. What initially sparked this passion? Three years ago, I had an afternoon to kill, and we needed supplies for the [parish festival’s] baked goods booth. I found a few [recipes] and I threw them together, and [thought] this tastes really good. It just took off from there. How did you land on the Great American Baking Show? About a year ago, a friend of mine on Facebook sends me a link and says, “You should try out for this.” I was like, I’ll never get on the show. Lo and behold they call…and I ended up on the show. What was that like? The amount of creativity [the bakers] had with flavors and design, I felt like they were way above what I could do, so now I’m trying to catch up to them. You preach about baking, too? Jesus was always doing things around meals. His first miracle was changing water into wine at a wedding feast. I incorporate baking and meal prepping into preaching, because it’s something everyone can relate to. What’s your go-to recipe? The next thing. I default back to breads a lot, but I always like the challenge of what’s the next thing to bake? How do I take what I’ve made before, learn from it, and apply that to something new? I don’t go back and bake the same thing multiple times. You also dabble in home brewing. It’s been awhile since I’ve brewed, [but] I plan on doing some brewing this summer. It’s an afternoon hanging out with friends watching a big pot of wart boil. It’s just a great social time for me. Any advice for novice bakers? Don’t be afraid to get out of your comfort zone and do something that’s perhaps really crazy, because you never know where it’s going to lead. You might find a passion for something that you never even knew existed. That’s really part of my story. I kind of started this on a whim and then all of a sudden I end up on a nationally televised baking show.